LG Electronics said on Friday that it will start selling the Optimus True HD LTE in Germany, Portugal, and Sweden, helping the number of available LTE devices to slowly grow across Europe. The first commercial LTE network may have launched in Europe. But while LTE has become a must-have on smartphones in the U.S., Europe is still lagging behind. Samsung's Galaxy S II has already started shipping, and a European version of HTC Velocity 4G has also been announced. Vodafone and O2 in Germany as well as Tele2 and TeliaSonera in Sweden all confirmed that they will start selling the LG smartphone. Starting next month, Vodafone and Tele2 offer it, and O2 will join them in July. TeliaSonera said it will start shipping the phone before the summer, according to a spokeswoman. Telekom Deutschland said it would not sell it. The Optimus True HD LTE has a 4.5-inch display with a 1280-by-720 resolution. 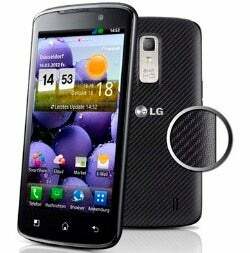 It is powered by a 1.5 GHz dual-core processor and also has a 8-megapixel camera. The current version uses Android 2.3. An upgrade to Android 4.0 is on the way, but LG doesn't say when it will be available. Before launching the smartphone in Europe, the Optimus True HD LTE started shipping Korea and is now also available in Japan, Canada, and the U.S., which shows that Europe is a low priority. The main problem is that Germany is the only big European market were commercial LTE services are available. Operators in France, Italy, Spain and the U.K. have yet to launch their networks. The U.K. hasn't even auctioned off the spectrum necessary to get started. The roll-out in those countries isn't expected to start until 201 in earnest, according Alan Hadden, president at industry organization GSA (Global mobile Suppliers Association). Therefore, it makes more sense to stick with just with HSPA, for now. Because LTE networks aren't widely deployed, Nokia plans to introduce the Nokia Lumia 900 with HSPA at 42M bps to ensure that users can still get a high-speed connection, according to a spokesman at the company. Apple's latest iPad also allows users to access the Web using HSPA at 42M bps, but the company didn't implemented the spectrum bands used for LTE in Europe. Globally, the number of LTE devices is growing fast. The total number of products with LTE was 347 as of April 4, which is around 15 percent higher than the number of HSPA+ compatible devices, according to Hadden. That is significant because the first commercial LTE network went live ten months later than the launch of the first commercial HSPA+ service, he said. There were 64 commercial LTE networks in 34 countries at the beginning of April, and the number of networks is expected to grow to 129 by the end of the year, according to GSA's data.